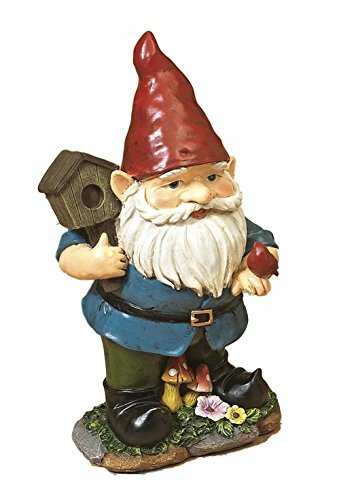 Gardens are meant to be magical - so why not combine humor and magic with Gnome with Sign! Featuring a natural little birdhouse with a little red bird sitting on his other hand. The Happy Gnome is adorned with a pointy red hat, blue shirt, black gnome boots, and a traditional bushy white beard. This resin gnome figure will bring out the best of all that is spring. Place him outside in your Garden or on your front porch to welcome all your guests! Makes for a Great Gift for Mother's Day, Birthdays, or Just for Yourself. Makes a Great Addition to your Porch, Patio, or Garden Decor!